A recent study reveals that the vast majority of migratory birds' routes are not protected - here's why that's a bad thing. Migratory birds travel a world that transcends international borders, and as such, are very difficult to protect under any one law. According to a report from the Los Angeles Times, a new study reveals that an astounding 91 percent of the world’s migratory bird populations lack protection along their routes, leading to dramatic declines in population numbers around the globe. The study was published in the journal Science, and could explain the drastic drop in flock sizes worldwide. The researchers, from the University of Queensland in Australia, say that the study highlights the need for greater focus on migratory birds’ needs throughout their entire paths in global conservation efforts. According to lead author Richard Fuller, an associate professor at the University of Queensland, migratory birds need a continuous stretch of suitable habitat along their entire path. 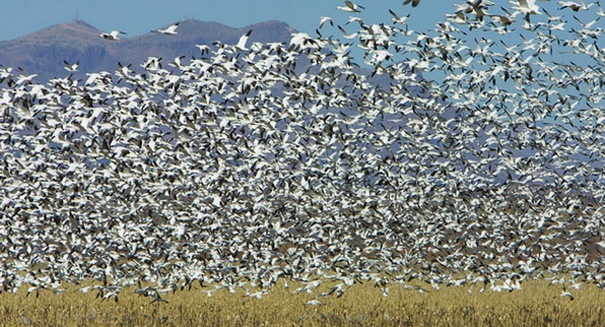 As massive flocks migrate south for the winter, they are increasingly running into disrupted habitat and interference from human activity. Dr. Fuller says that it is crucial to protect key links in this habitat chain. If we fail to, he warns, an unnecessary amount of birds may die before they ever reach their winter habitats. In some cases, birds travel a distance to the moon and back three times during their lifetimes. Young birds can be picky eaters, and one of the main reasons so many birds migrate is to find the best possible locations to raise their offspring. The study examined 1,451 different species of migratory birds in an attempt to determine how their specific needs could be met as they traveled the world. By comparing a map of the paths of the 1,451 bird species to a map that plotted the specifically protected areas throughout the world, researchers discovered that a shocking amount of habitat offered little to no help for these nomadic species. This is a far cry from the 45 percent of non-migratory birds that reside in protected habitats. As these intrepid birds make unfathomable trips across the world, the need to conserve key areas along their routes becomes increasingly apparent. A press release from the University of Queensland outlining the details of the study can be found here.